Back in March we launched a new capability which allows you to create a free-form Journal of your trip! This is a space for route authors to tell their story and really share the experience. You can easily insert formatted text and images to make your trip come to life. I'm using this feature for a bike trip that I have planned this month in France, Belgium and Holland. It turns out to be a great place to share some of the planning information for this trip with my co-riders. I will also journal the story while we're on the road - so I can share the experience with friends and family back home. Personally I prefer this to using other social media sites. It's just a better way to tell the story. A few weeks ago I added the ability to paste in videos from YouTube and Vimeo. In the planning phase I added a few public videos from YouTube of the areas we'll be visiting. While on route, we'll post some of the GoPro videos we take as we ride. You can see the journal for my route at Bayeux to Amsterdam, or more quickly view the journal Route Journal - Bayeux to Amsterdam. The Best Authoring Tools. If you've journaled on other sites you will know that authoring rich text and images on the web can be challenging. Many sites have you input in one part of the page, and view the formatted result in another. That makes for an awkward and disjoint experience at best. At MyCycleTour we give you the ability to enter your text and images in a fully formatted window - a true "What You See is What You Get" authoring capability that is second to none. Try it once an you will see the difference. One Stop Shop. Integrating a modern journaling capability with the other great planning and sharing tools on MyCycleTour makes your Route really shine. The Route Author is the only one that can enter content into the Journal, but you can also engage with other users who can post comments and questions to your page making it a truly interactive experience. You can even link it to your favorite social network. How do I start? Whenever you create a route in MyCycleTour (just click on the "create" menu item once you are registered and logged-in) we will set up a space for your journal. When you display the route the journal will be included near the bottom of the page. 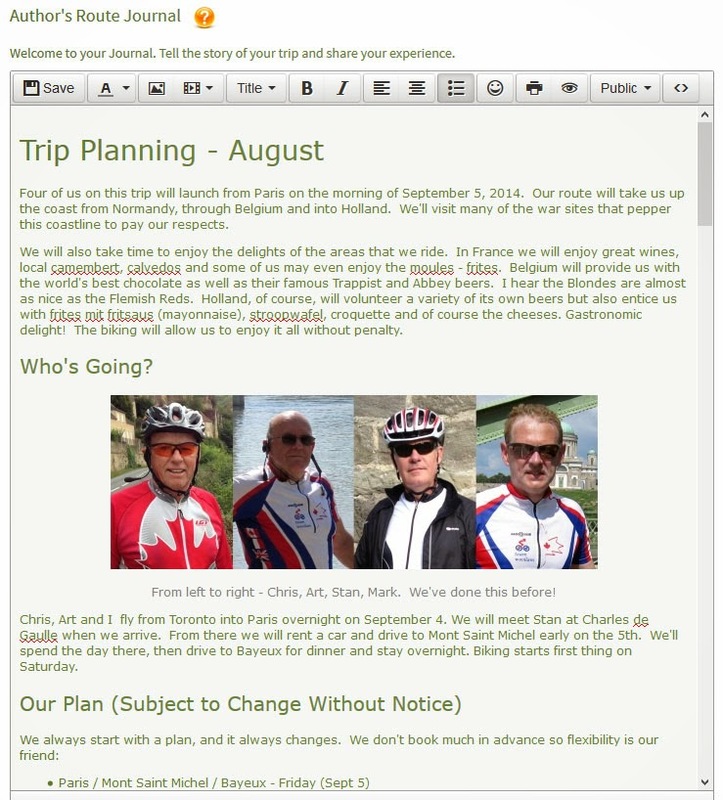 Only the author can add to the journal, but other MyCycleTour users can post comments below the journal.